Welcome to our website (Balbriggan.info). If you continue to browse and use this website, you are agreeing to comply with and be bound by the following terms and conditions of use, which govern Balbriggan.info’s relationship with you in relation to this website. If you disagree with any part of these terms and conditions, please do not use our website. We may revise the Terms and information contained on the Website at any time and without notice. Each time you use the Website you will be bound by the then current Terms and our Privacy Statement and you should review these each time you access and use the Website to satisfy yourself that you are happy with them. 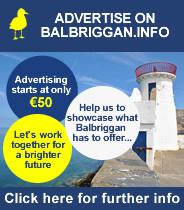 The term ’Balbriggan.info’ or ’us’ or ’we’ refers to the owner of the website. Our company registration number is 507928 (Dublin). The term ’you’ refers to the user or viewer of our website. If you choose, or you are provided with a website login, password or any other piece of information as part of our security procedures, you must treat such information as confidential, and you must not disclose it to any third party. We have the right to disable any such member identification account or password, whether chosen by you or allocated by us, at any time, if in our opinion you have failed to comply with any of the provisions of these Terms. This website contains material which is owned by or licensed to us. This material includes, but is not limited to, the design, layout, look, appearance and graphics. Material that you submit to or post on the Website grants us a worldwide, irrevocable, non-exclusive, royalty-free license to use, reproduce, adapt, publish, translate and distribute such material in any media, together with the right to sub-license such rights. You must not use any part of the materials on the Website for commercial purposes without obtaining a license to do so from us. You may not post, modify, distribute, or reproduce in any way any copyrighted material, trademarks, or other proprietary information belonging to others without obtaining the prior written consent of the owner of such proprietary rights. Balbriggan.info respects the intellectual property rights of others.